This poem was shared with me by Tony Jacklin back in 1973 on a flight back to London from Madrid. We had missed the cut in the Madrid Open and I was quitting to fly home to Australia after a disappointing second round 81 following on from an opening round of 69. As chance has it, Tony invited me to sit alongside him and I told him my sad story of how I had been away from Australia for several months and was homesick and disappointed with being close to the lead after Round One and then to miss the cut was a blow to my confidence and ego. Tony then started to tell me his story of being homesick while playing in SE Asia and again after missing 8 cuts in succession on the US PGA Tour after winning the US Open in the previous year. He was moping around his Home and was by accident in his wife’s Library area when he reached into the bookshelf and pulled out this book and it opened up to the page where this poem was waiting to be read. This poem turned his attitude and financial future completely around and a few weeks later, Tony Jacklin wins the British Open. After listening to this inspiring story from Tony, I was turned around too. 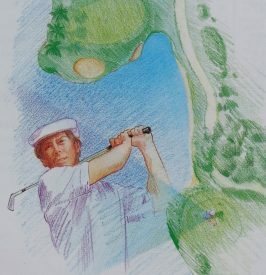 I took the return flight back to Paris and the French Open – played in my first British Open – made the Quarter Finals in the Picadilly Medal Match Play and saw my friend, Simon Owen win the German Open. Attitude certainly builds altitude and if you think you can or you think you cannot, you are mostly right 100% of the time. 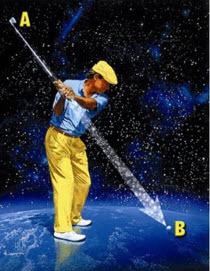 I invite you all to test drive the “A to B – Your One Drill to Better Golf” eBook and with a “can do” viewpoint you will greatly improve your compression on the ball – gain distance – think less – and play more. Previous Article Previous Article: Have You Got Rhythm? Have You Got Music? Have You Got Your Swing?